Bears running back Matt Forte has found himself at the center of a lot of trade rumors lately. 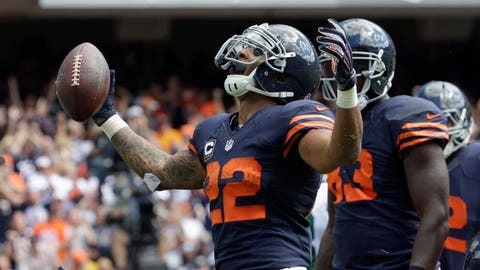 The Chicago Bears’ decision to trade Jared Allen last week has opened the door for speculation about other players being on the trade block, including star running back Matt Forte. "I think it’s funny," Forte said. "The media, I don’t know. I guess they start to speculate and then they report it as news and it takes off. That’s how news gets more and more views, likes and listens, I guess. So they were speculating when the draft was coming up this past offseason that I was going to be traded then and nothing happened. So I can only control how I play on the football field. I don’t really worry about it. I just think it’d be crazy to trade me anyways." Forte trails only Minnesota’s Adrian Peterson on the NFL’s list of leading rushers (367 yards), and he’s one of the league’s best pass-catching running backs. Forte, who’s approaching his 30th birthday, is on pace to put up exactly 2,000 yards from scrimmage this season. By trading Forte, the Bears would be dealing away a massive chunk of their offensive production. However, Chicago could also lose Forte and get nothing in return next spring, when the two-time Pro Bowl RB becomes a free agent. The possibility of a trade remains, if the Bears have no plans to re-sign the aging back after this season.